“Mad Mike” Hughes is a former NASCAR crew chief, denier of science, and daredevil. This weekend he will launch himself over a mile in a homemade rocket. 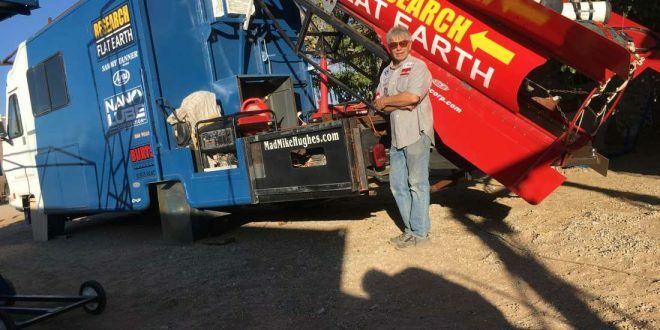 Hughes says he expects his new rocket to hurl him through the skies above the Mojave Desert ghost town of Amboy at up to 500 miles per hour for roughly one mile, attaining a peak altitude of 1,800 feet before it deploys two parachutes. Hughes is a proponent of the Flat Earth theory; the Research Flat Earth group is his main sponsor. Hughes does not “believe in science,” which he told the AP has “no difference” from science fiction. Hughes has done a lot of this kind of thing, winning a Guinness World Record in 2002 for jumping “102 feet in a Lincoln Town Car stretch limo.” He also survived a manned steam rocket flight in 2014, traveling 1,374 feet and earning himself three days of recovery from extreme g-forces and a rough descent, the AP wrote. Hughes certainly seems to be aware that blasting yourself into the sky is not something that most people would consider a particularly good idea, given possible outcomes like being scalded by red-hot steam or smashing into the ground at lethal speeds. But he also seems pretty determined to do this, so I guess we all owe it to him to hope for the best possible outcome.